Designed to allow for practice walking and riding bikes, complete with crosswalks where pedestrians and bicyclists need to stop and look for people crossing. The specialty spaces are designed to look like store fronts. This design mirrors our goal for students to be included members of their community. Part of our instruction includes taking students into the community to practice their skills. The building design prepares students for other community settings. In the center of each learning village is a “village square” that houses a variety of support spaces (speech therapy rooms, kitchens, storage, offices). The common spaces allow for students from different classes to interact with each other and for teachers to group students for instruction. It provides a play space, larger space for movement and an adult living space for older students to practice daily living skills. Music therapy room, motor depot, art room, vocational room, teen closet and recycling room. Spaces provided by an anonymous donor will allow students to expand their participation in the arts, movement and in vocational training. Natural light and indirect lighting fixtures, along with specialty blinds, allow staff to adjust the lighting in many ways. This is important to calm students who are upset and to prevent overstimulation for students who are highly sensitive to light. An innovative system that will assist in the instruction of mobility skills for students who are in wheelchairs. This system allows students to be in an upright position out of their wheelchairs, and supports them so that they can learn to move about and explore their environment. It is a system that will allow young children to be supported while crawling and allow more independence. It is a room covering system in the classrooms, so that children who are able to move can go anywhere in the classroom. The system is also used to lift and move students who need assistance in the bathroom and to position students on mat tables out of their wheelchairs. 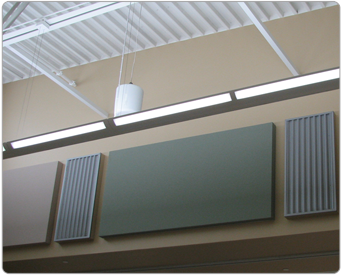 Alarm system has spoken alarm signals instead of the loud siren, which causes extreme distress in some students. Doors are alarmed and there is a security system that is computerized that can show where a door was opened if a student should get outside of the building without assistance. 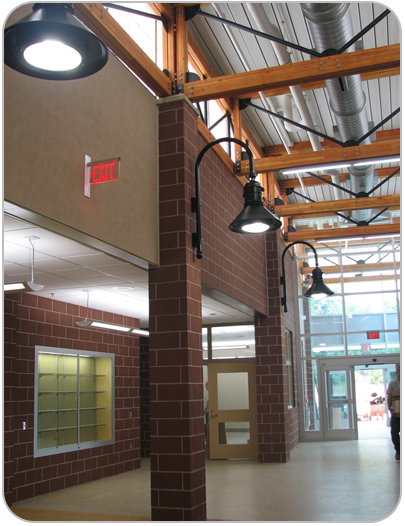 The entrance is designed so that visitors must come into the office before being allowed into the rest of the building, as a safety precaution for students and staff.